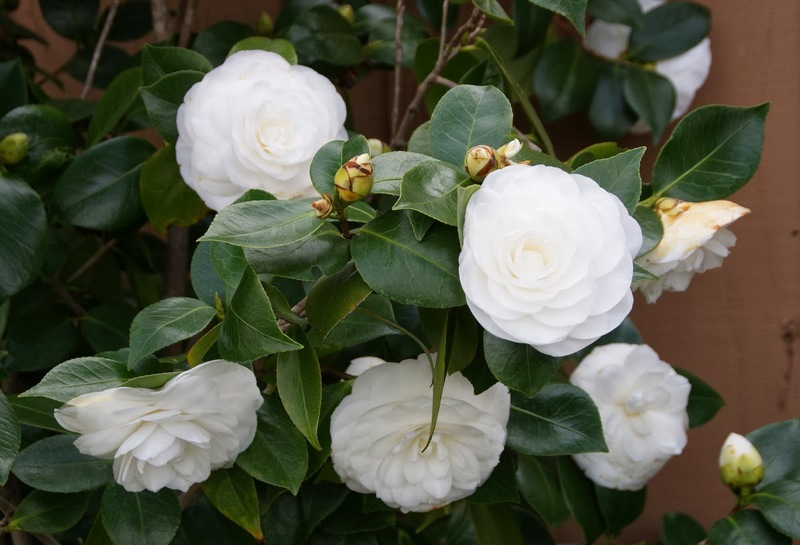 My White Camellias are in Bloom! 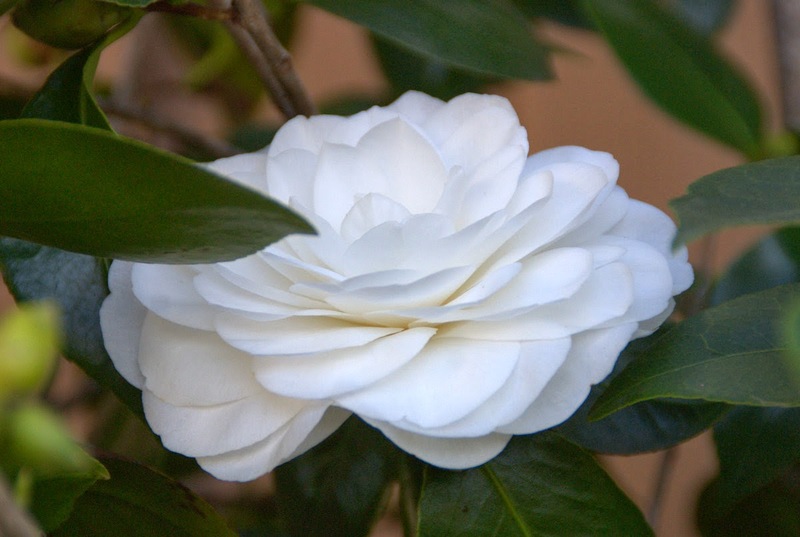 One of the things that I truly look forward to here each winter is the bloom of my 'Nuccio's Gem' camellias. I planted them last year finally in the ground and this is their first bloom with their feet in the cool, moist soil. 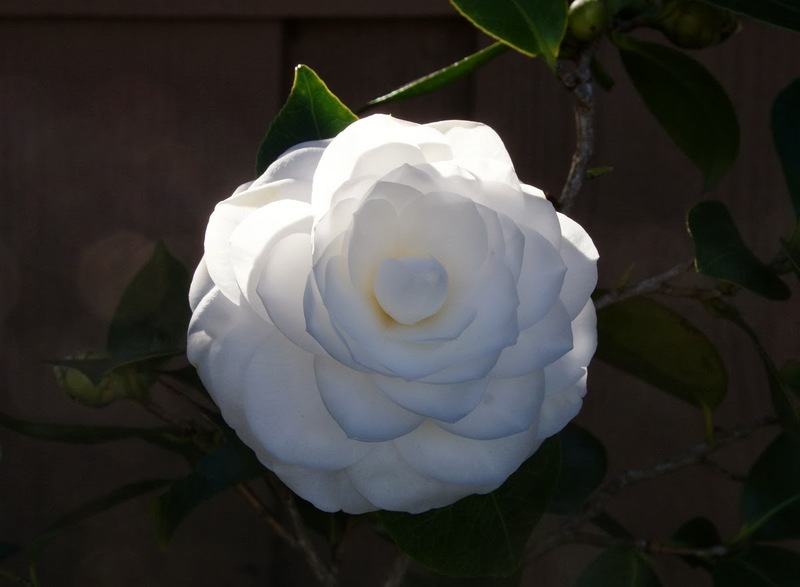 They just take my breath away with their ethereal beauty and I would like to share a few photos from my camellia bed with you today! To me the flowers of 'Nuccio's Gem' are pure perfection! 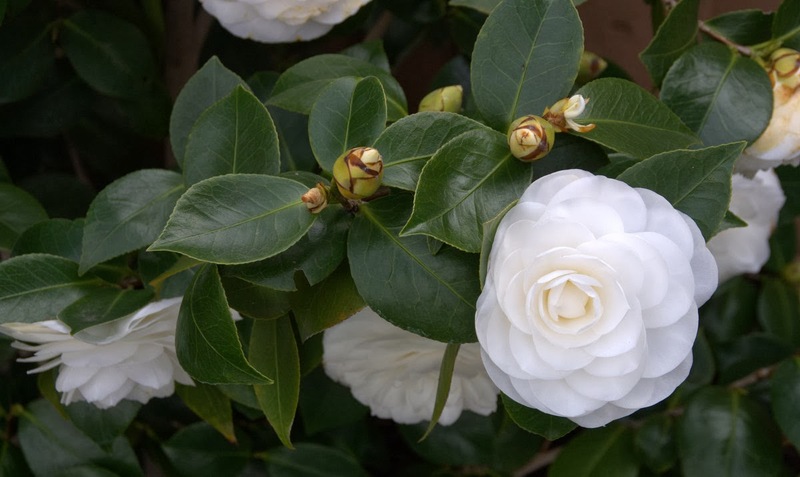 This is a view of the whole camellia bed. It is not big, I know! The 'Nuccio's Gem' camellias are framed by two hydrangeas, 'Penny Mac' (a repeat flowering variety, that didn't repeat last year!) 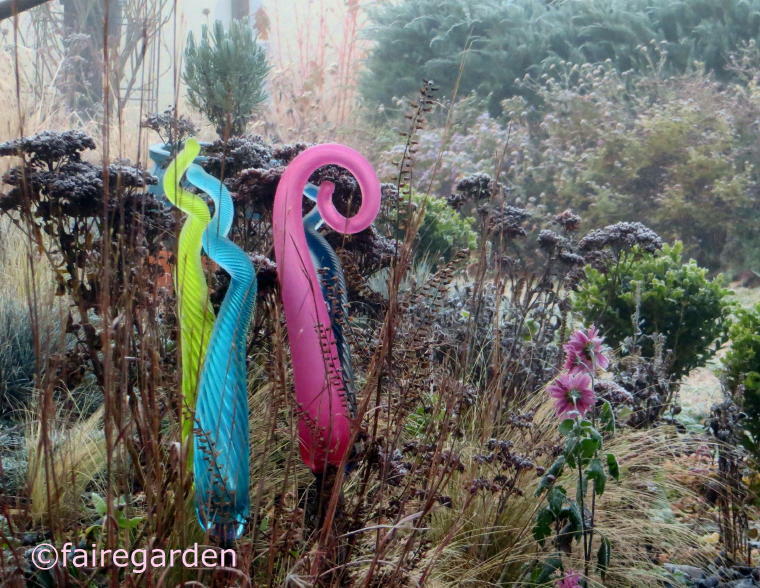 to the left and an unknown cultivar to the right, which have just started to leave out on this photo. 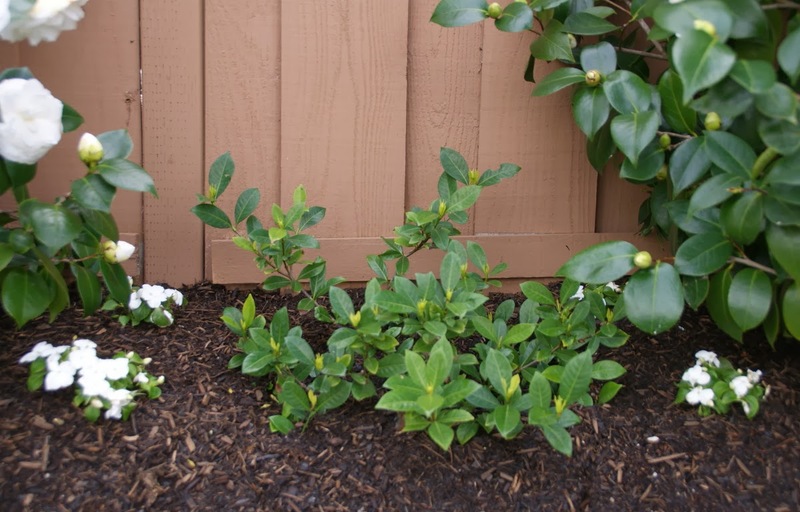 In the middle I have planted a gardenia 'Veitchii', which does surprisingly well. 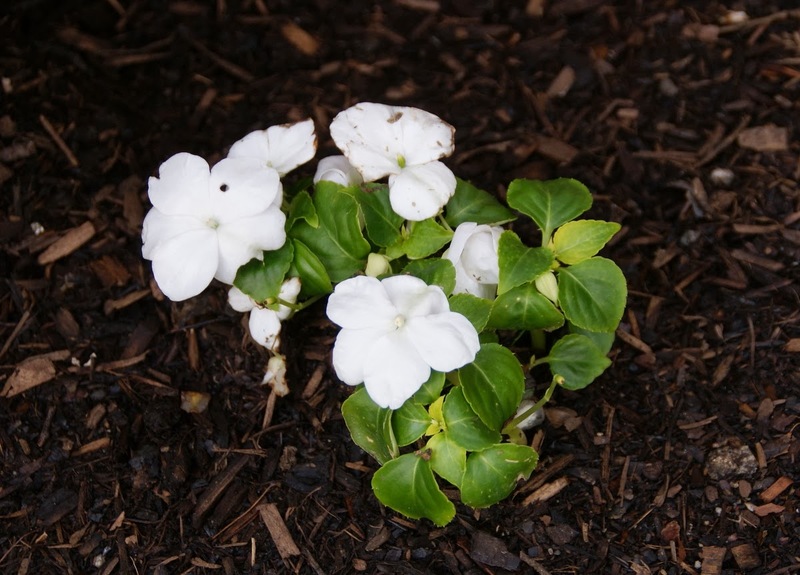 To bring more white color into the bed I planted white impatiens. I just did this last week and I hope they spread out and fill in. To continue the white color scheme I decided to "decorate" the bed a little bit like you would do in your house with white objects like the lantern, the head planter, and the lamp-like hanging shell piece, that we bought many years ago on a vacation on Kauai. Don't ask me what the purpose of it is, besides being pretty! I am not sure yet, if my white deco objects are "too much", but if I decide they are, I can remove them very quickly. I bought the lantern many years ago at Ikea and it has become quite rusty over the years. Usually I like a little bit of rusty patina, but in this case I would prefer if it would be pure white. I think, they still carry them. Maybe I gift myself with a new one. 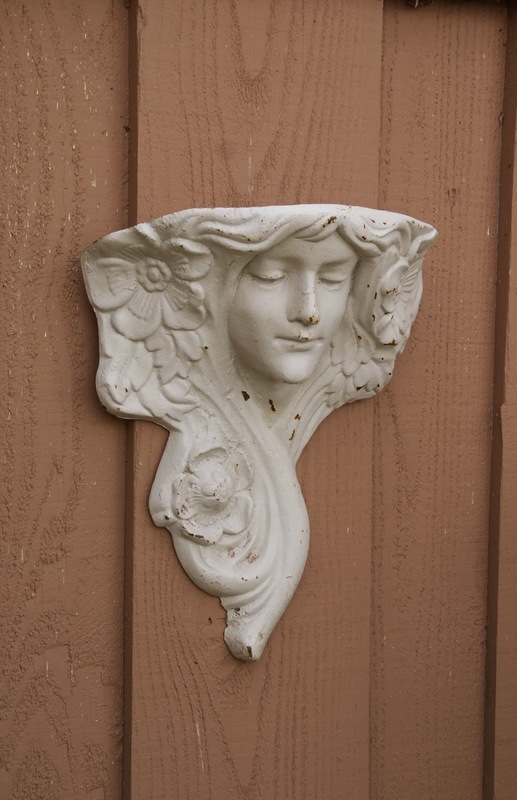 This cast iron head planter is unbelievable heavy for its small size. 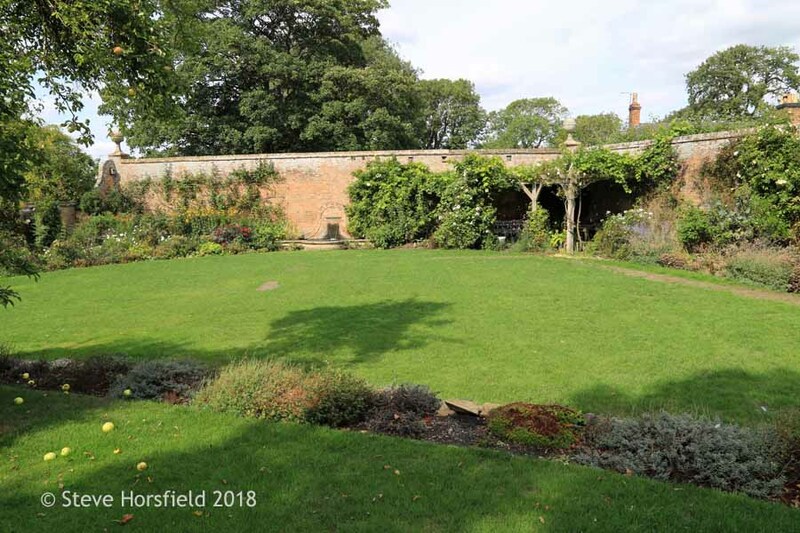 I am very sentimental about it, since we bought it at a garden shop at one of the smaller public gardens that we visited in England a few years ago (unfortunately the name has slipped my brain, but I still can "see" the garden in front of my eyes). I tried to plant white impatiens into it, but somehow that didn't cut it. 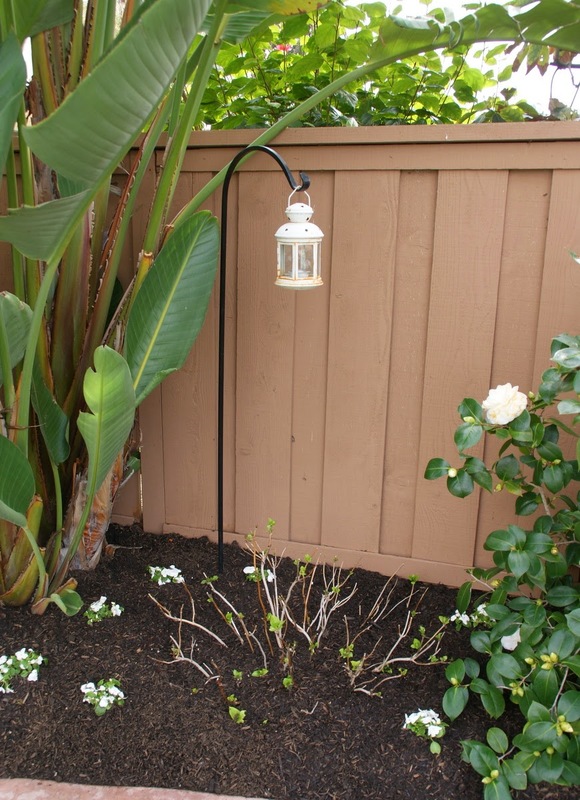 It looked just too homogeneous with the other white impatiens planted on the ground. Being less polite, you could also call it boring! Now I am thinking to put a trailing succulent in it or even leave the planter unplanted. As a matter of fact, I like it as it is! This "shell lamp" from Kauai. I just love this piece for the look of it, but also because it evokes very special memories of our vacation in me. 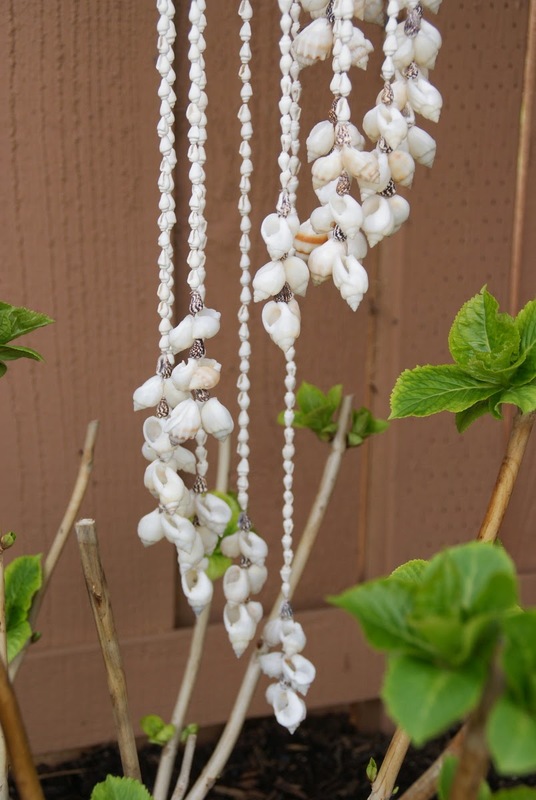 Here is a close-up of the delicate shell strings. It looks handmade to me. If that is the case, it must have taken quite a bit of time to craft something so beautiful and delicate like this. The bright green leaves of the hydrangeas are so cheerful. They radiate freshness, juiciness, and lushness. All sure indications of spring! I wondered why my hydrangeas were leaving out so late, even though we have an unnatural warm winter so far and anything else is way ahead of its time. The answer is, as usual I should say, because they weren't fertilized. My soil is so poor in nutrients, that if I don't fertilize almost everything on a regular base, nothing grows really well. The moment I put down fertilizer around the hydrangeas, they leaved out. Lesson learned! I am very happy with my gardenia 'Veitchii' this year! 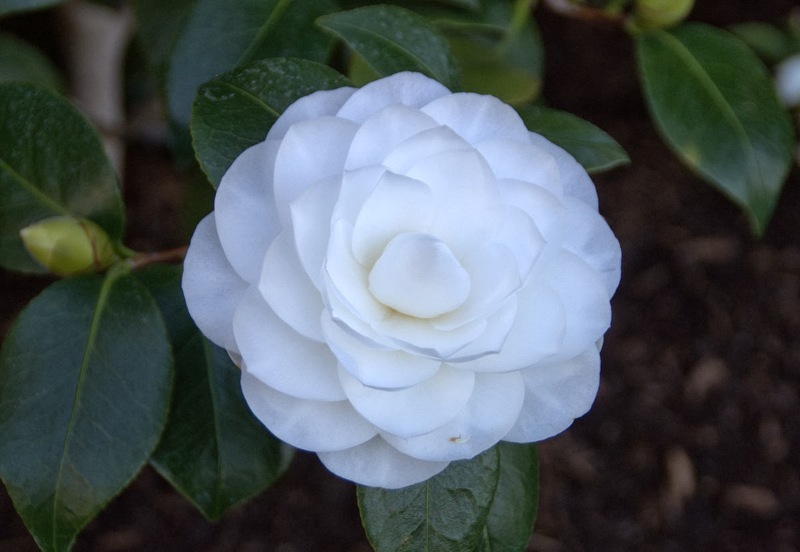 Gardenias have a reputation of being notoriously difficult to grow, but after being fertilized mine looks happy and healthy so far. I don't know if you can recognize it on my photo, but it even has set buds already. 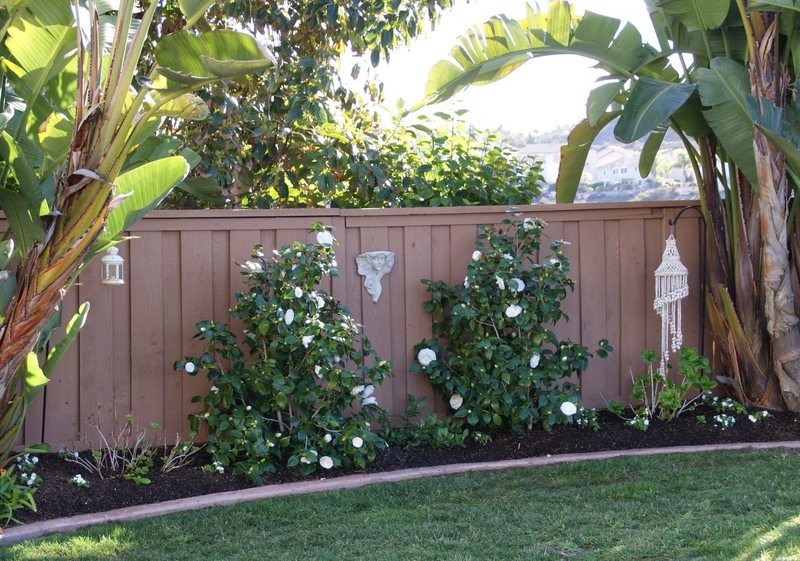 This gardenia has an incredible fragrance. I can't wait to smell it again! It is surprising to myself, but this is the first time that I am growing impatiens ever in my whole life! I was looking for a small, white flowering, floriferous plant that would do in full shade and only cyclamen and impatiens came to my mind. Cyclamen I find quite tricky to grow here in Southern California, so I opted for impatiens. The variety is called 'Super Elfin White'. I have no idea how they will fare in my garden, but I am eager to find out. Hopefully they will become a little bigger soon and brighten up this space with their clear white flowers. 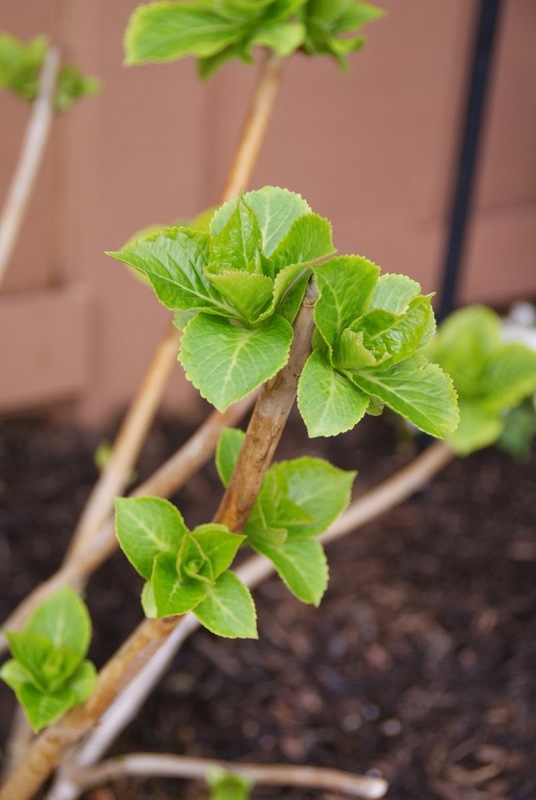 Located on the very left side of the camellia bed, the 'Penny Mac' hydrangea is even more behind in terms of leaving out than the unknown variety to the right. I hope its leaves will grow bigger soon, just to make the space look less plain. 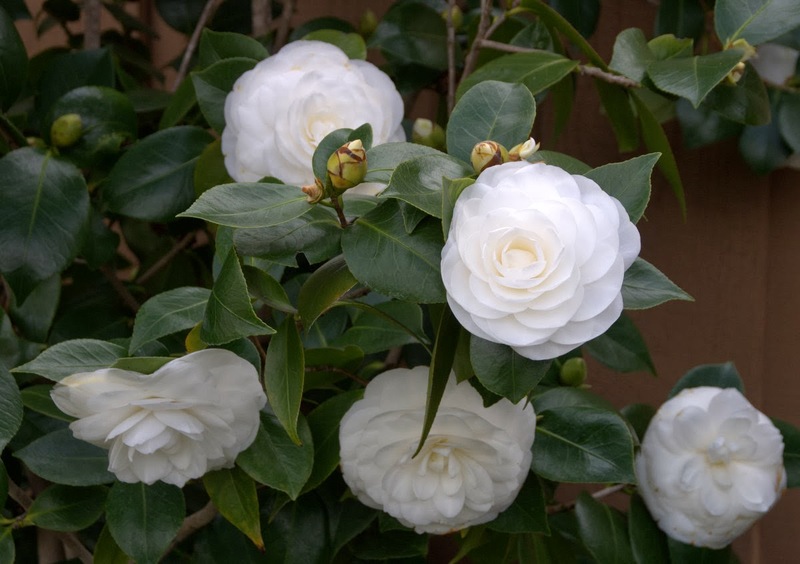 Here are a few more beauty shots of the blooms of the 'Nuccio's Gem' camellia. For one fleeting moment I am quite pleased with the way this corner of my backyard looks! 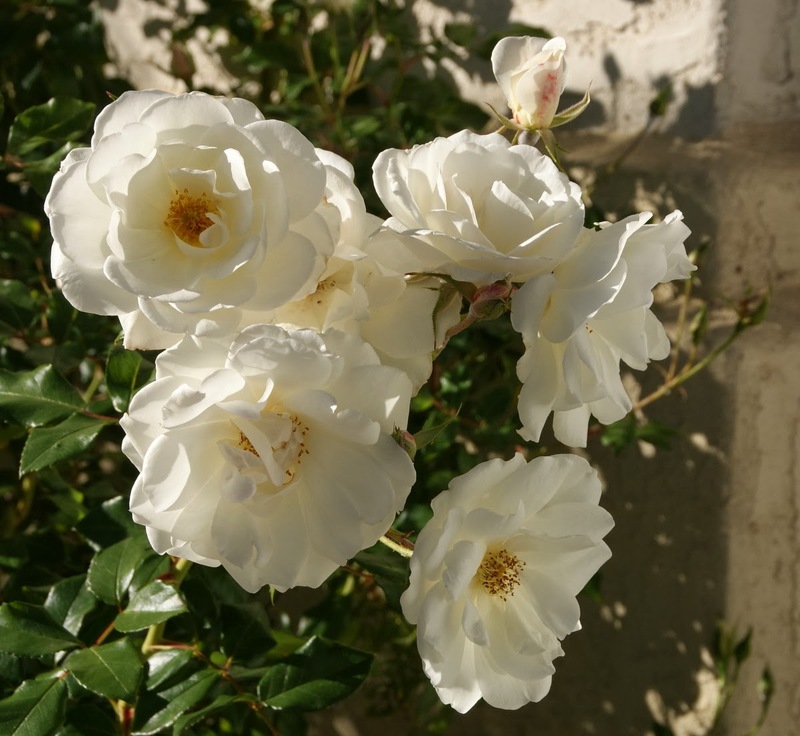 More than time to come in with the post about my roses that were blooming in January! Last month started off with a little bit of craziness weather-wise. In parts it was as hot as it is in summer here. That, of course, promotes rose blooms and I had quite a bit of roses still flowering even though it is winter. But I haven't fertilized my roses since last year October, hence the bloom quality wasn't that great and the leaves of the bushes, well, what can I say, they are more than ready to go. It is very much a concern here in Southern California, and as a matter of fact, for the whole state of California, that we haven't had any substantial winter rains so far. The much needed rain, that everyone was hoping for also didn't come in January. I read an article in USA Today recently, which reported that the governor declared, we are having a "mega-drought" and that water restrictions are to come this year. Surprisingly, the article stated that water restriction wouldn't be reinforced in Southern California yet, which, of course, was a big relieve for me, because there simply will be no roses without water, period. Nonetheless, my husband and I try to do our best to conserve as much water as we can in the house and in the garden. One new strategy is to mulch way higher than I ever did before and I hope that will help. January is traditionally the month where I deleave and prune most of my roses, but somehow this year I am particularly late. I am still not completely done yet, but hope to finish the task by the end of this week. Then all roses need to get fertilized and mulched. So February will continue to be a very busy month for me here in terms of rose care, but I guess the reward is near. It could very well be, that in March I will have already plenty of roses blooming, again. 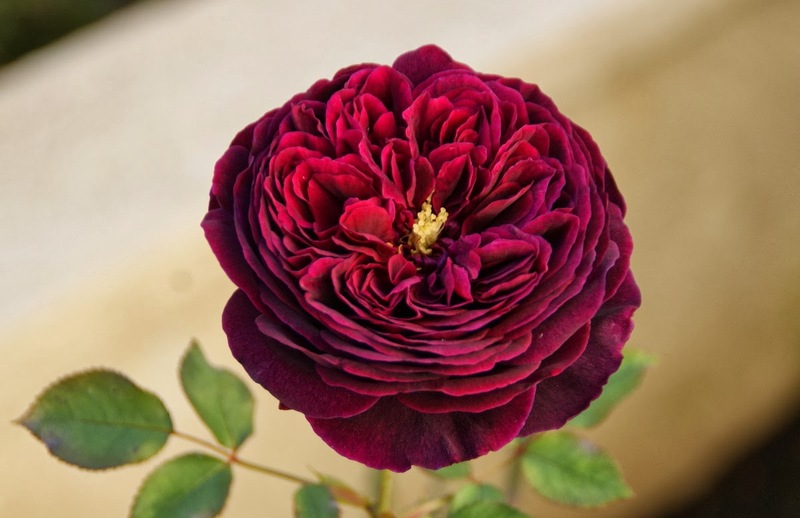 The first one is 'The Prince', a very beautiful dark crimson red shrub rose, bred by David Austin (United Kingdom, 1990). 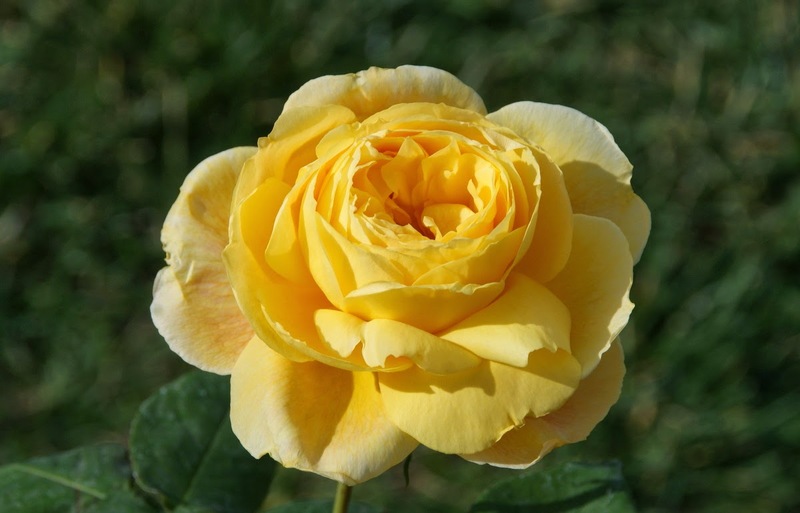 Besides the gorgeous color, the strongest asset of this rose is its unmatched fragrance. It is not only very strong but particularly delicious. 'The Prince' does stay relatively small for me here, maybe 3 x 2 feet by now, which is a good thing, since many of the David Austin roses get humongous in California and don't fit in small gardens very well. 'The Prince' does come with some flaws, though: It gets a bit of powdery mildew from time to time and so far it isn't very floriferous. The rose needs to be shaded from our brutally hot afternoon sun, otherwise the flowers will crisp. This is 'Halloween', a yellow-orange Hybrid Tea rose with very full big blooms bred by Arthur P. Howard (United States, 1962). Honestly, I don't know why I have ordered this rose, because as nice as it is being by itself, the intense yellow-orange color clashes with all the more muted, pale roses that I have in my yard. It gets even worse when 'Halloween' really shows its orange side. Right now it is still residing in a container and I don't know if I am able to integrate it into my garden. We will see! It seems to be a good rose, so I guess if I decide to part from it, there will be no problem to find a new home for it. 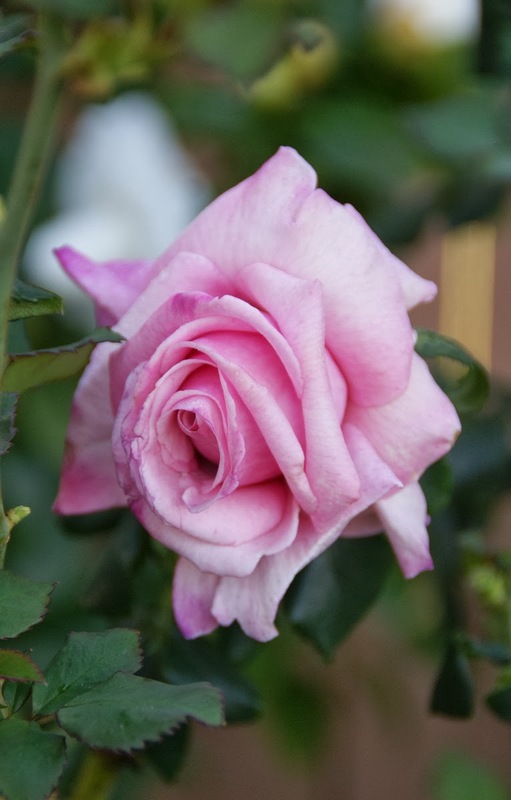 Besides 'Iceberg', 'Our Lady of Guadalupe', a light pink Floribunda, bred by Keith Zary (United States, 2000) was my most floriferous rose bush last month. It just keeps the blooms coming and coming. 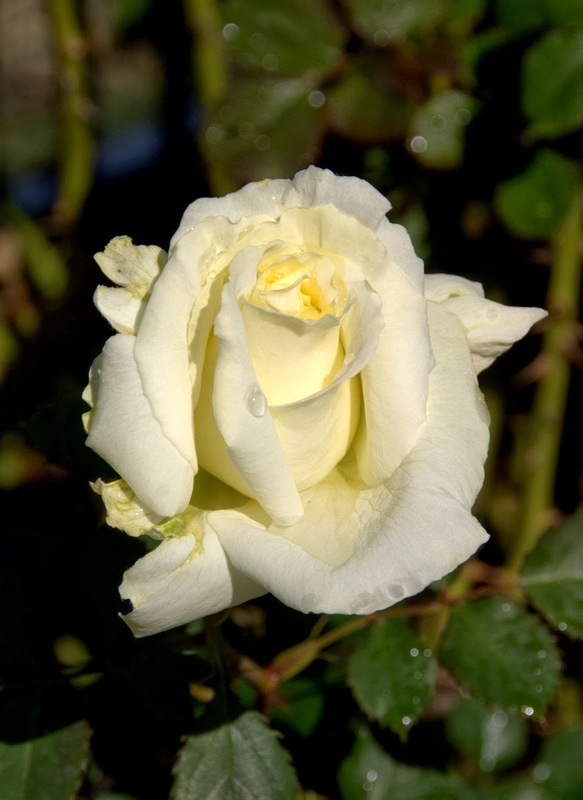 Too bad, that it has its issues with powdery mildew, which really gets to me more and more, since I know now, that I can grow completely clean rose varieties in my no-spray organic garden. 'Iceberg, Climbing' faithfully blooming along! 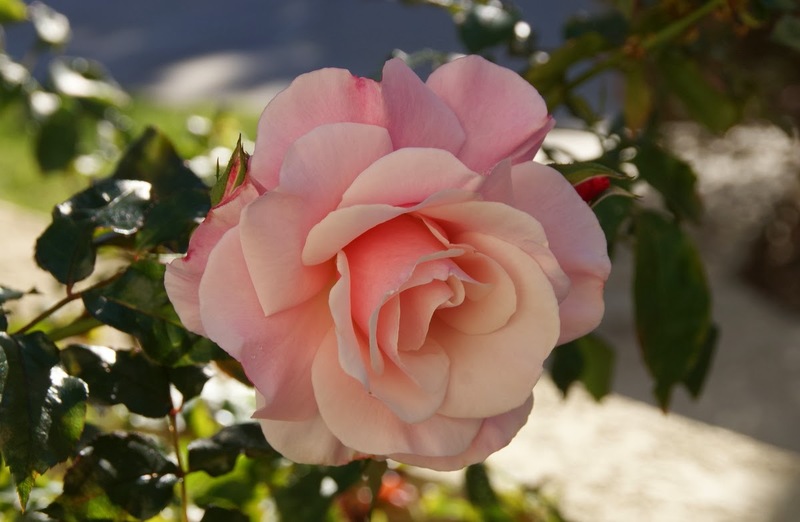 It is an old standby Floribunda rose here in California. The shrub form was bred by Reimer Kordes (Germany, 1953) and the climbing sport was discovered by Cants of Colchester (United Kingdom, 1698). It is very weird that I have shrubs and climbing forms of 'Iceberg' that are completely mildew free and others mildew at times. I wonder, if this is not only due to their location in the yard (micro climates! ), but also to the fact that some of them are grafted on Dr. Huey rootstock and others are growing own-roots. The 'Iceberg' roses that are grafted on that rootstock seem to be more prone to powdery mildew in my observation. I am curious to know, if there is scientific evidence to back up my theory, but so far I haven't had the time to do some research on this topic. 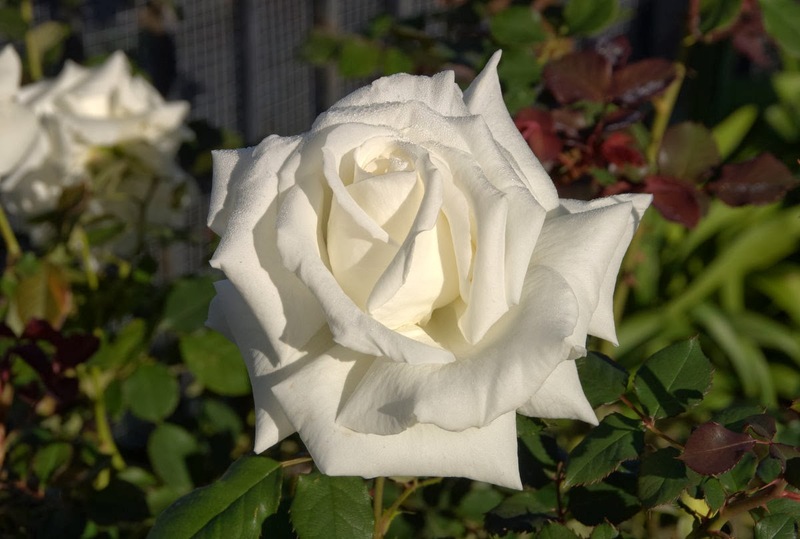 Bud of 'Moonstone', Hybrid Tea rose. 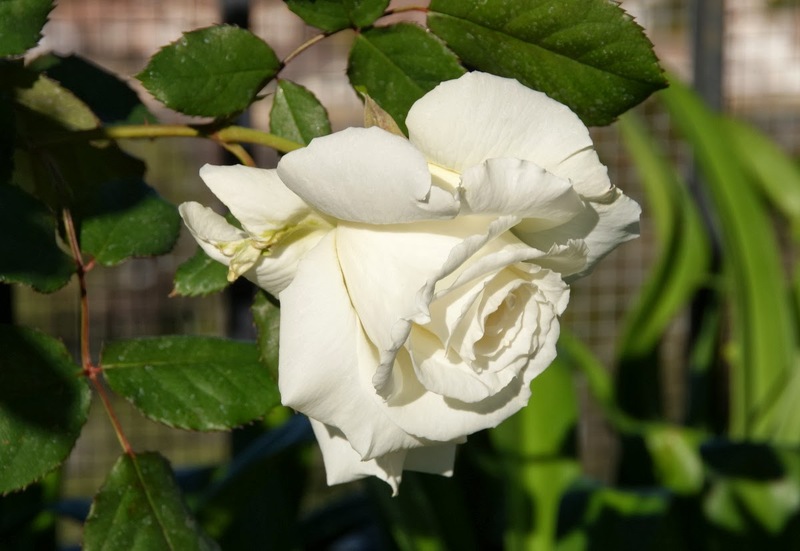 'Moonstone' is a white blend rose with pink edges and incredible big blooms. It was bred by Tom Carruth (United States, 1998). I brought the opening bud featured in this photo into the house and it became a huge lovely bloom, as it usually is the case with this rose, and lasted quite a while in the vase. 'Moonstone' can certainly be called a good cut rose! 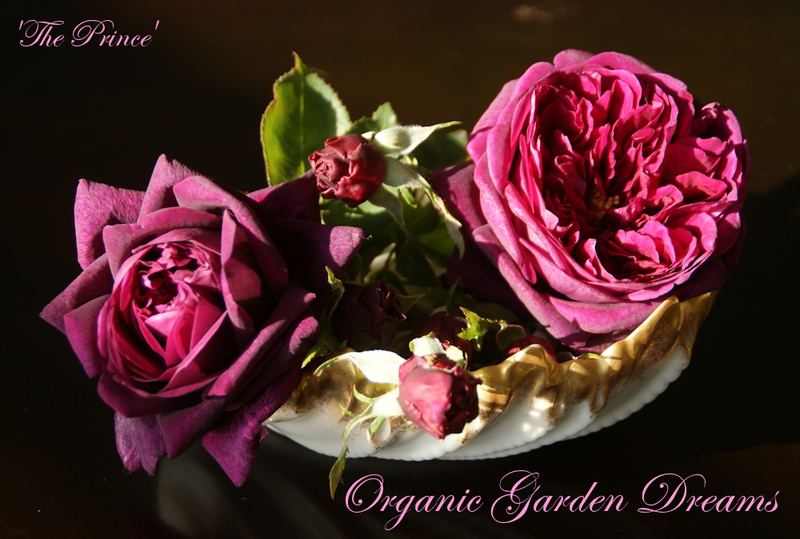 'Vi's Violet', a lavender Miniature rose, seems to love to bloom in the winter. The rose suffered a bit from blackspot as it did last year at the same time. I like the small perfectly shaped blooms very much. It is supposed to be fragrant, but I can't detect any scent at all. ... and perfect when in full bloom. And almost each bloom is like that, not just the ones that I select to take photos of. As a matter of fact, I like it so much, that just today I ordered a second one. And in my small garden that says something! 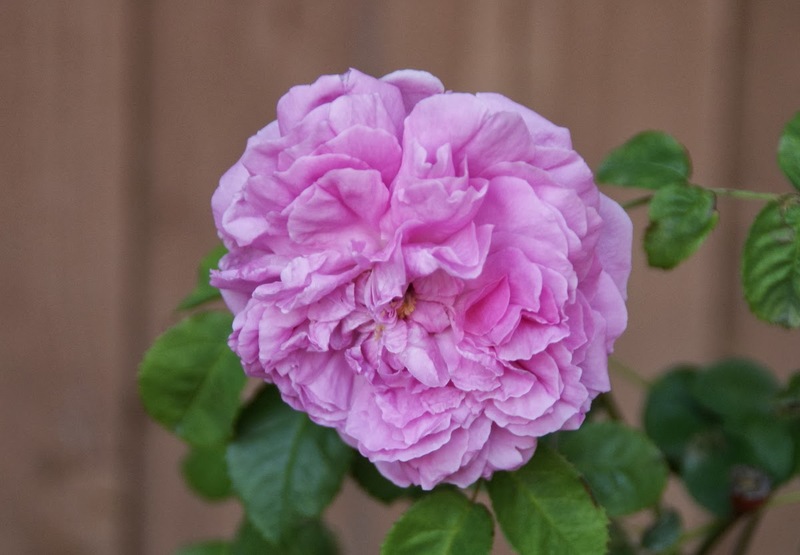 Last but not least, here is 'Baronne Prevost', a Hybrid Perpetual rose of a pink color that fades nicely to a lilac shading, bred by Jean Desprez (France, 1841). To be honest, this is a somewhat unloved rose, because in my garden it looks like an accumulation of bare sticks with some leaves on top of the canes, which often get mildew. But every now and then it produces a bloom, and when it does, the flowers are lovely. I think, I only haven't let go of it by now, because of the sentimental value that it has for me to grow an Old Garden Rose like this. I planted two of my roses out of the pot ghetto into the ground lately and they have already set new buds. I am excited about it and hope, that in the February rose post I can show their blooms to you. From one of them I haven't spotted a flower myself, yet. It always gives me such a kick to find a rose blooming in the yard for the very first time!